BUY TICKETS NOW BEFORE IT'S TOO LATE - VERY LIMITED TICKETS ARE LEFT!!! WE WILL SELL OUT!!! See you & your friends there! Be sure to "Like" & "Share" above to help spread the word!! Includes open bar from 9-1am, food buffet, champagne toast, and DJ entertainment all night long. Ticket sales ended at: 12/31/2018 at 10:00 PM $89.95 Ended 23! Includes everything with General Admission tickets, just at a great discount for buying 8 or more tickets together with friends! 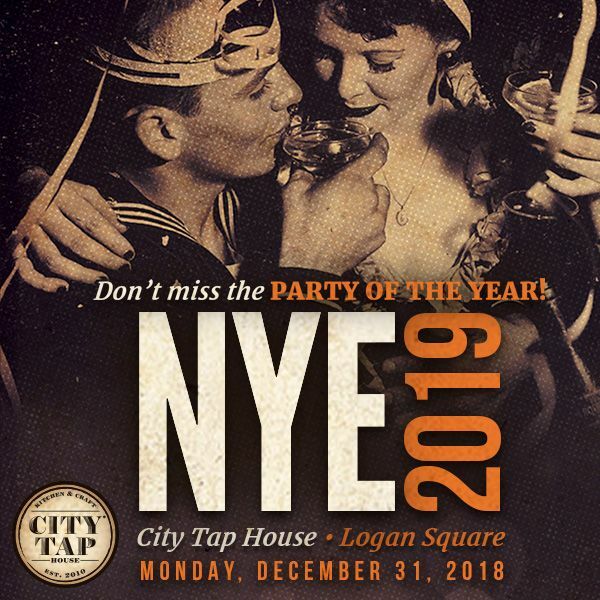 New Years Eve Philly 2019 at City Tap House Logan Square in Center City Philadelphia. Grab your friends to experience the very best in service, craft beer, food, party favors, and music while ringing in the new year right! Upgrades to VIP and Reserved Seating are available (quantities very limited). Limited to groups of 4 or more people only. EXTREMELY LIMITED TABLES LEFT!! Bottle Service Upgrades Available. Please click "contact the organizer" above for more information. Past Event Action Videos from City Tap House & The Glitter City Gala Ringing in 2017! City Tap House® Logan Square offers craft brews on draft, cask, and by the bottle, from local breweries and our favorites from around the world. With our authentic, brick oven pizza and elevated, American pub fare, City Tap House® has truly updated the gastropub experience. Focusing on a rustic yet comfortable bar and dining atmosphere featuring reclaimed barnwood and repurposed steel, guests can enjoy private dining as well as a lively bar scene with a 15 foot multiscreen television and an open view of our kitchen. City Tap House® offers guests the best bar and restaurant experience in Philadelphia at Logan Square. View More Events Organized by City Tap House - Logan Square. Offering 60+ craft brews from local breweries and our favorites from around the world as well as authentic, brick oven pizza and elevated, American pub fare, City Tap House has updated the gastropub experience. This event is organized by City Tap House - Logan Square.